Dentistry primarily treats two major maladies or pathologies of the mouth. Dental caries, or dental decay, is probably the most well known pathology. Another common disease for the dental professional treats is Periodontitis, also known as Gum Disease, Pyorhea or Periodontal Disease, this malody attacks the gums, the bone underlying the gums and the connective tissue which seals the gum tissue to the teeth. Periodontitis is primarily a disease process that results from poor oral hygiene. While some individuals who are diagnosed with this malady may consider themselves to have good oral hygiene, the fact of the matter is that thin layers of tartar or calculus, which begins to form below or at the gumline, creates a rough surface that the patient cannot completely clean no matter how hard they try. Therefore, it is not only those who do not brush or floss who get this malady. Some individuals who are prone to build up tartar (dental calculus) can have below the gum-line tartar "fouling" the roots, making it impossible to clean no matter what the patient does on a daily basis with their oral hygiene. The photo to the right illustrates what happens in the Periodontal D isease process. 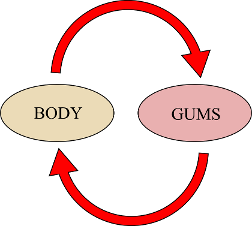 Calculus retains plaque bacteria under the gumline and creates a chronic inflammation of the gum tissue. This happens because the roughness, created by the tartar, makes it impossible to fully clean the neck of the tooth or its root surfaces the are above the bone level. Floss or toothbrush bristles that sweep under the gum line, and over the rough surfaces, do not fully clean the plaque away. Plaque instead sticks to the tartar. The living bacteria in the plaque, which coats the tartar, stimulates the body's immune system. This stimulation creates a response in the tissues known as inflammation. While inflammation and swelling is not the same, severe cases of inflammation is often seen clinically as swelling (or edema). Swollen gums that bleed easily are said to have gingivitis. If, however, this gingivitis condition persists, and the inflammation begins to break down the bone about the roots, the condition now turns into Periodontitis. The picture to the right illustrates what happens under the gum tissue when periodontitis is present. To diagnose Periodontitis, one must use an instrument called a Periodontal Probe. This instrument is a straight, thin shaft which has markings in millimeters along it's length. Using this probe, a dentist or hygienist will conduct an exam which measures six points around each tooth in the mouth. The clinician is attempting to determine how far under the gum line the probe can be inserted. Measurements of the sulcus (the collar of tissue about the tooth) should not exceed 3 millimeters in a healthy mouth, and there should be minimal or no bleeding when the probe is removed. When a measurement of 5 millimeters is detected, this can mean, in most cases, that a periodontal pocket is present. Periodontal pockets will almost always bleed when the probe is removed--indicating active inflammation at this site. Bone loss is what allows the probe to reach such a depth, for as the bone is lost, the attachment which defines the bottom of the sulcus, moves down with the bone level. Once a sulcus reaches 4 to 5 millimeters in depth, the oxygen at the botton of this sulcus is minimal. This provides an excellent environment for anerobic bacteria (bacteria which do not like oxygen). It is this type of bacteria that causes more severe gum inflammation, toxins which invade the tooth structure and also creates malodorous breath. The photo to the right, shows how the bone loss below the gum tissue results in exposure of the tooth's root. To treat periodontitis one must give the patient a cleansable tooth. Teeth that cannot be fully cleansed of plaque, because of tartar or bone defects, will continue to have inflammation in the gums about them and this inflammation will continue to cause more bone breakdown. Two main methods are used to help the patient obtain a cleansable tooth. The most common method is called scaling and root planning. In this non-surgical procedure, the tartar below the gumline and at the gumline is scraped or vibrated off the teeth. 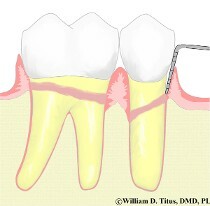 Once the root and crown is glassy smooth, the patient can now floss and remove plaque effectively. If they do this effective plaque removal on a daily basis, the tissues will typically respond well and a significant decrease in inflammation will occur in the gums. When inflammation disappears, swelling decreases and this often results in more shallow probe readings on the gum examination. In some cases, pockets can completely disappear. A second method to treat periodontal disease, is used when the bone defects created by bone loss, prevents a patient from flossing all the way down the bone-free root surfaces. These "below the bone" pockets cannot be cleansed because gum tissue, and/or bone, on one or two side of the defect, prevents it. In this scenario, a levelng of the bone, removal of excess gum tissue and a cleaning of the roots is accomplished through periodontal surgery. Typically performed by a specialist known as a Periodontist, its objective is the same--to give the patient a cleansable and maintainable set of teeth. The radiograph to the left illustrates how advanced these bone defects can become. These teeth are hopeless because of the advanced state of bone loss and probably exhibit significant mobility. New advances in Periodontal therapy now includes the use of special lasers. Such therapy is proving to render excellent results that were once thought impossible without surgery in the past. This exciting new development in dentistry is making it possible for even long-term Periodontal patients with a history of prior surgery to find impressive results. Highly controlled lasers beams, at specific wavelenghts, are directed into the periodontal pocket and such laser light helps to destroy toxic proteins that had to once be scraped off the teeth. The light also creates changes in the soft tissue. This new therapy is well accepted by patients and is much preferred over the often onerous surgical procedures that were formerly used. Periodontal laser therapy also tends to be less costly than the surgery that was formerly used to treat the disease. While the previous radiograph represents a hopeless case, the radiograph to the right is more typical of what surgery is designed to correct. Between the two smaller teeth (the premolars) the bone has resorbed in such a way that the crest of the bone runs downhill. This is called an angular bone defect. In such situations, surgery is almost always required to prevent this situation from becoming like that in the previous x-ray. Advanced stages of periodontitis can be unsightly. Root exposure, tooth movement, heavy tartar, stained tartar, swelling, dark puffy gum tissue and halatosis become significant problems. The middle photo to the right is that of an individual with an advanced case of periodontitis. Your dentist, with regular check-ups and cleanings can help keep your mouth clean, sweet smelling and beautiful. Check-ups can help catch periodontitis in its early stages which will prevent the unsightly damage that this disease can cause. Typically, a loss of dental insurance, or some other unexpected financial set back, will lead people to stop check-ups and cleaning for a period of time. That break in exams and cleanings can be just the opportunity gum disease needs to get a firm hold and produce irreversible changes. Periodontal patients must understand that regular maintenance and exams are essential for successful treatment of this disease. Essentially an inflamatory disease, this inflammation must be controlled and such control only happens by ensuring the teeth and their roots remain free of toxic plaque and tartar. Uninsured patients can pay a bit at a time for their examinations and cleanings BEFORE the visit to help cushion the expense without insurance. Don't go missing. Keep on a schedule to keep your smile beautiful. Certain health conditions can complicate attempts to get gum disease under control. One such common disease is that of Diabetes. Poor control of Diabetes and elevated blood glucose levels make obtaining good healing of the gingiva a much more difficult task. More aggressive treatment on such patients is typically warranted and patients will require more diligent home care regiments. Other diseases, or the medication used to treat such diseases, also effect the outcome of this disease process. For instance, an individual with Epilepsy who is taking Dilantin to control seizures, can have fibrous gum growth of the gingiva that easily creates pocketing about the teeth. Your dentist will make certain recommendations when he believes your health history may be a complicating factor to your gum disease. Apart from our health having an impact on our gingival health, chronic gum disease can also have an effect on our general health. Studies have shown that those with chronic Periodontitis are more likely to have lower birth-weight babies, artherosclerotic disease and pancreatic cancer. It is postulated that toxic proteins from anaerobic bacteria that are associated with gum disease, have distant effects on the body. One researcher suggested that a moderate case of Adult Periodontitis is analogous to having a six inch square, non-healing wound on one's skin. While more needs to be learned about this aspect of gum disease, it is certainly wise to not allow gum disease to go untreated. At one time we saw Periodontitis as a self-limiting disease--meaning once the teeth were lost, the disease ended and its effects were localized. With new research suggesting distant effects on the body, this disease is no longer viewed in such a manner. Essentially, we are finding that the body's conditions affect the gums and the gum's condition's have effects on the body.